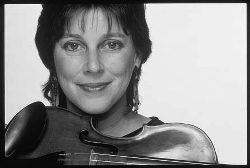 As you might imagine, here at GelRest, we get a lot of queries about how to make a violin more comfortable, so musicians often ask us about the violin shoulder rest. The way we see it, the GelRest provides comfort and protection to those parts of your body above the shoulder, like your face and neck for instance, while the shoulder rest does the same for parts of your body below, like your collarbone and breast. Having a bit of padding at BOTH areas of contact will offer the most protection — thus preventing bruising while also reducing tension. The result is you will practice more, which is the key to faster improvement, and more fun! So, a shoulder rest is a good place to start, but it’s only half the battle, because chinrests and shoulder rests work together to achieve optimum comfort. Make sure your chinrest is comfortable, click Here. 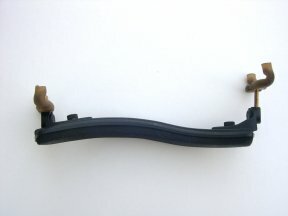 Note, to try this, your shoulder rest must have adjustable feet. Next, try setting the two adjustable feet at very different heights –one side high and one side low. See photos. That’s because when you hold the instrument up to your chin, your left shoulder will easily contact the instrument, but your right shoulder willl not contact the instrument at all — in fact, there may be a gap of 3 or 4 inches between the instrument and your right side. 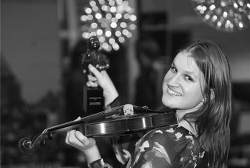 Try holding your instrument up in playing position, and see for yourself. 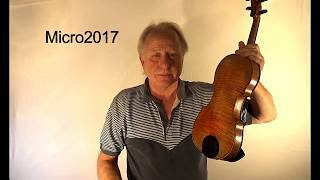 Here’s how I set up my shoulder rest. Set the foot on the left at the lowest position possible, by turning it clockwise. Set the foot on the right at a higher position (turn counter-clockwise), so it makes contact with your body. Experiment with the right foot height to find the position that’s right for you. Looking down from the neck of the instrument. The extended right side is easy to see. Another view. Note that the shoulder rest is at an angle across the back of the instrument. Try to copy from the photo. If your shoulder rest doesn’t feel comfortable for you, try changing this angle. Don’t forget to protect your face! It doesn’t make sense to have padding on your shoulder but not on your chin rest! Go here for more information about the GelRest. 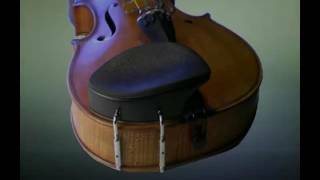 We are a small family company that became involved in violin ergonomics through the efforts of GelRest inventor Stephen Kallai, a lifelong violinist and fiddler, who sought to ease a chronic, nagging pain in his back that seemed to flare up within a few minutes every time he picked up his instrument. Although he tried different stretching excercises, postures, and shoulder rests, nothing really helped. Inspiration came one evening when he heard the story of someone who was being treated for chronic back pain. The origin of their pain, it turns out, was traced to dental work the patient had received years before. Apparently, the stress from the dental work on their mouth and jaw had migrated to their back! His attention turned now to his chinrest. He decided to experiment with gel materials similar to the kind in his computer mouse pad. 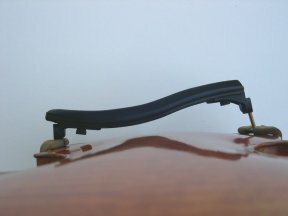 His idea was to develop a pad that molds to a player’s unique bone structure, that could be easily be attached to a violin chinrest. Early models were pretty crude, but even then, one clear result told him he was on the right track: his back pain had disappeared! Since then, The GelRest has improved greatly and as of this writing in 2011, over 30,000 have been sold! 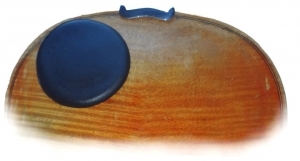 For anyone with back pain, neck pain, or just the common red mark associated with playing the violin, a soft chinrest that molds to you can make a big difference! When he’s not making GelRests, Stephen plays with his band 77 El Deora. Check out this clip from their European tour. Song is written by bandleader and guitarist Maurice Tani. Check out this clip from the bluegrass band Savannah Blu, playing at the 2009 Grass Valley Bluegrass Festival in Grass Valley, California. Song written by guitarist Dore Coller. Thanks for taking the time to learn more about the GelRest.